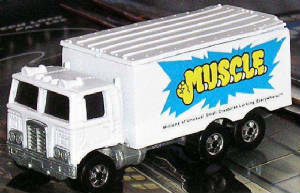 This is a picture of an authentic M.U.S.C.L.E HiWay Hauler. Because this is a prototype there are only approximately 5 of these trucks know to exist. 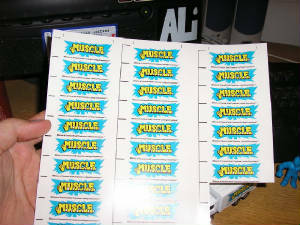 This is perhaps the most valuable piece of M.U.S.C.L.E memorabilia. It is valued at over $1000. 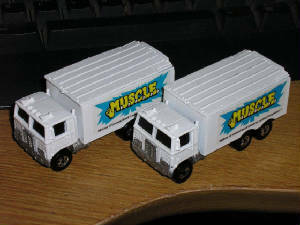 Even if you had an extra couple of thousand dollars the supply of M.U.S.C.L.E Haulers is too small. The only way to own a M.U.S.C.L.E Hauler, is to build a M.U.S.C.L.E Hauler. 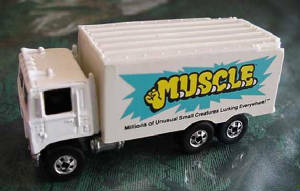 While I’m not an expert customizer I think my guide should help you “acquire” your own M.U.S.C.L.E Hauler. The two above pictures are from a thread in the Mattel Hot Wheels Discussion Forum. 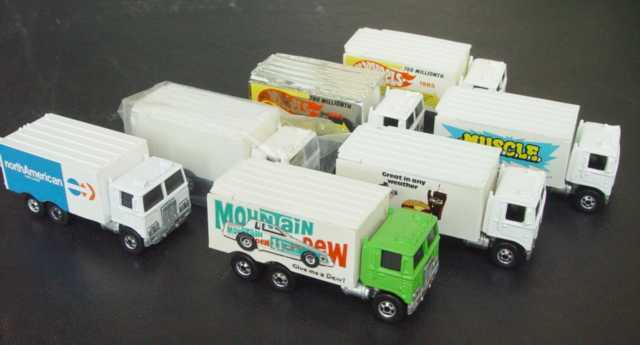 They show the M.U.S.C.L.E Hauler in the midst of other HiWay Haulers, many of which are also quite valuable. But let’s get started. There are lots of ways to customize Hot Wheels cars and trucks. This is the method I used. It was simple enough that I was able to make my first customized toy. If you are an expert customizer, then you may have different methods but feel free to use this as a guide. There are two starting points when you want to make a M.U.S.C.L.E. HiWay Hauler. The first point is that you just grab a truck. If you do this, then skip to Step 2. If you want your M.U.S.C.L.E. HiWay Hauler to be as perfect as possible, then you are going to take a different path. You will need then to get a HiWay Hauler from the right time period. It will also help if you work with a white truck. It would be possible to use another color, but using a white truck will hide more of your mistakes. o This would be my suggestion for the truck to use (See Figure A Below). It seems to pop up on eBay fairly often, and tends to be the most affordable of the 4 trucks. 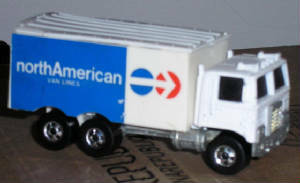 I tried to get this truck from Hot Wheels collectors, but they tended to want about twice what it was going for on eBay. All of the collectors I dealt with stuck with Tomart’s price guide as a Bible. It was my experience that the car cost between $10~$15. This, like all toy prices, could change. o I haven’t seen many of these on eBay. So I’m unable to say much about the price. o I wasn’t able to find these cheap. These seem to be popular with Hot Wheels and He-Man collectors, which is bad news for MUSCLE collectors. However, many of these trucks were still on their cards. Perhaps this would be easier to get loose? 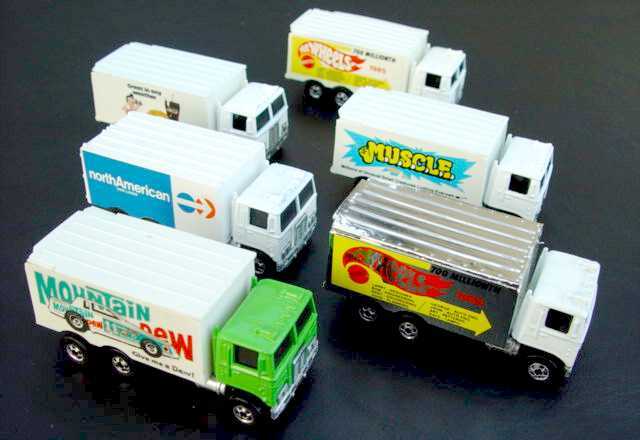 o I saw this truck sporadically on eBay, and Hot Wheels collectors seemed to have them. But again these tended to be more expensive than the North American Van Lines truck. This would be a good choice if you can get a good deal. Ok, now you’ve got your HiWay Hauler. Let’s get ready to destroy any of its monetary value. Make sure the truck is as clean as possible. I would not suggest just dropping it in some soapy water, but make sure it as clean as possible. Use your own discretion here. I simply used a Clorox handi-wipe and took off some surface dirt and grim. You are going to want to lightly sand your truck. This will help remove any extra debris, and help your primer to stick. But be VERY careful. The tops of these trucks are very soft. 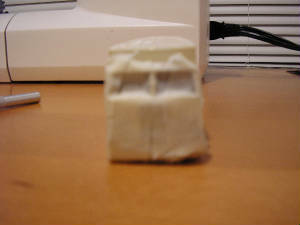 If your sand paper is too coarse and/or you press too hard, then you could easily start to sand away details. 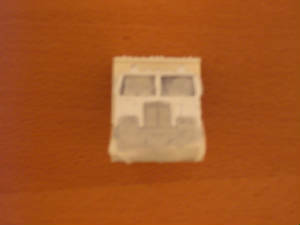 I really concentrated on removing some of the paint from the sides of the trucks (See Figure B Below). Again I didn’t go overboard. I noticed that with the North American Van Lines truck the paint almost seemed to smear. This is normal. Remember you’re just trying to remove some of the paint, and to help your primer stick. Don’t go crazy with the sandpaper! I purchased my sand paper from a hobby shop. Ask the clerk for the finest sand paper they have, and they should be able to help you. Tell him you are customizing a Hot Wheels car, and they should know what you need. At least my hobby shop did. This will take a little time so be patient. This step is crucial, because this will protect the pieces of the truck that you don’t want to paint (i.e., the chrome, wheels, windows, etc.). 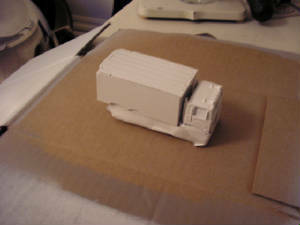 I found that it is best to start with the base of the truck, specifically the wheels. What is nice about HiWay Haulers is that the back of the truck overhangs the wheels. 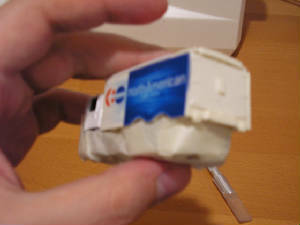 This allows you to slide the tape under it (See Figures C, D, E, F Below). 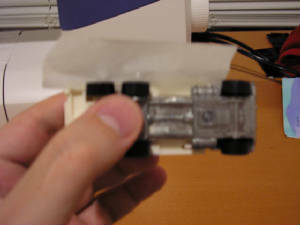 Then lightly push the tape down, and continue around the base of the truck. This should protect the bottom of the truck. I used a few layers of tape so that nothing would seep through the paint, and that cracks in the pieces of tape were covered with other pieces of tape. For me, this was the most difficult step. 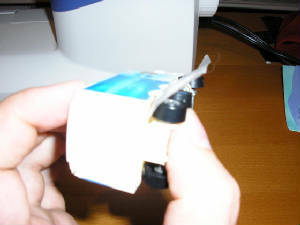 Placing the tape over the grill and windows was easy (See Figure G Below), but the challenge is to use a straight edge razor to remove the excess tape. You want the tape to remain on the grill and windows. 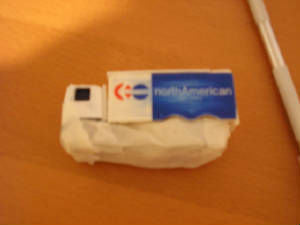 And I’ve found it’s better to leave a little too much tape, instead of not enough (See Figure H Below). But don’t worry if it’s not 100% perfect. By using the straight edge you can easily remove any of the extra paint. I used Testors Spray Enamel (1237 Flat Gray Primer) to prime the truck. If you prefer a different product, then defiantly use it. This is simply the product I used. I should note that I put two coats of primer on the truck. 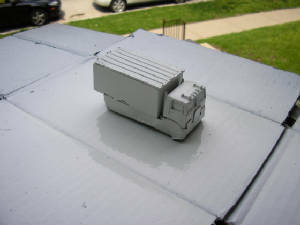 If you spray correctly, then you will probably need to put on a second coat too (See Figure I Below). 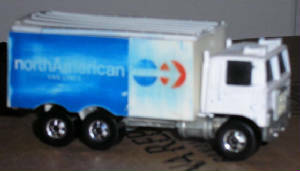 I used Testors Spray Enamel (1245 Gloss White) to paint the truck. If you prefer a different product, then defiantly use it. Again, this is simply the product I used. I should note that I put two coats of paint on the truck. If you have sprayed correctly, then you will need to put on a second coat too (See Figure J Below). Thanks to the creator of Nathan's M.U.S.C.L.E Page I was able to get an excellent replica graphic. The challenging part of this step is actually printing the sticker. I think it is better to use a sticker sheet that doesn’t have any shine. When you look at the original graphic it doesn’t look very shiny. That is why you should try to use a sticker sheet that doesn’t have a glossy finish. The first time I tried to print this logo I wasn’t able to find a printer that could print the blue light enough. I hope you have a fantastic printer and this isn’t a problem for you. The only way I was able to fix the problem was by going to a local print shop. I suggest going to a local shop instead of a chain. They will be much more willing to help, and probably won’t charge you as much as a chain. No matter what, make sure you ask about costs up front. I was quite pleased with how the sticker sheet turned out (See Figure K Below). Once you have the stickers it is up to you how you want to place it on to the truck. I prefer to use the straight edge and cut away as much of the excess sticker as possible. After you have your sticker ready use the original picture as your guide and stick that baby on your truck. Don’t forget the other side! Congratulations! You’ve saved over a 1000 dollars and you’ve got a M.U.S.C.L.E. HiWay Hauler that is just as good. Figure L (See Below) shows two of the HiWay Haulers that I made and Figure M (See Below) shows a comparison between the actual Hauler and the custom Hauler.